Tata Motors might not be the most enthusiast-oriented brand in the country (leave the Xenon and the Safari Storme aside and there’s not much left for the enthusiast) but all that will change very soon. The company recently showcased the Bolt-based Sport hatchback at the ongoing 2016 Auto Expo, and it’s headed to production soon. Made in collaboration with Coimbatore-based Jayem Automotives (the ones responsible for Formula MRF racers, the hugely appreciated Super Nano, etc. ), the Sport is likely to be launched later this year, reports Overdrive. 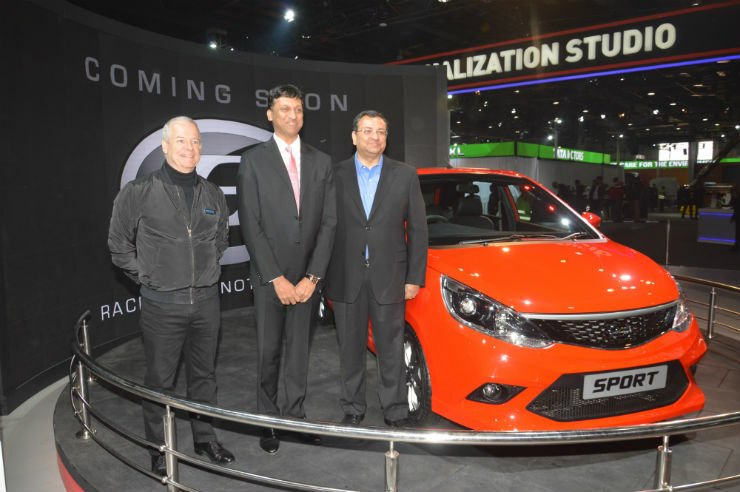 Following that, the company will also have a sporting version of the Zest among other products. It remains to be seen how much better it is (in comparison to the Bolt it’s based on) but the 1.2-liter turbocharged petrol ‘Revotron’ engine makes 110 PS and 170 Nm of torque in the vehicle. The company claims a 0-100 km/h time of 12 seconds – which is still about two seconds off the Polo GT TSI’s pace – and the Sport also gets an added bodykit. Other notable additions (as mentioned by Tata Motors) include a remapped ECU, a high-flow exhaust system, distinct ‘S’ badges instead of the company’s logo, a leather interior with red stitching, disc brakes on all four wheels, and a performance suspension – which along with the bigger 17-inch wheels is said to give the vehicle ‘a lower ride and planted handling’.